Motorists who are caught using a hand-held mobile phone while driving will have three penalty points added to their licence, the government says. Transport Secretary Douglas Alexander said the maximum fine would also double to £60 from 27 February. He added that it was "impossible to do two things at once" and that using a mobile while driving was dangerous. But the Liberal Democrats say only about one in 100 offenders are being caught by police. Mr Alexander said: "Research shows that talking on a mobile phone while driving affects your concentration and ability to react to dangerous situations. "It's quite simple - it's impossible to do two things at once and do them well. "That is why in December 2003 we introduced new laws preventing motorists from driving while using a hand-held mobile. "We have seen a groundswell of support for this move. "But, worryingly, while 92% of people agree with the law, 21% of drivers admit to breaking it." Shadow Transport Secretary Chris Grayling said: "This is a perfectly sensible change and we support it. "But the trouble with changes like this coming from ministers in ivory towers is that they have left our roads to be policed by speed cameras rather than real traffic officers - and so people will carry on getting away with offences like this." 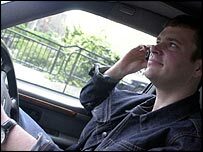 Home Office figures for 2004 show that nearly 74,000 fixed-penalty notices were issued in England and Wales for illegal use of a mobile phone while driving. A Liberal Democrat study last year suggested this meant only 1.1% of those who admitted to the offence were being caught. The party combined the Home Office figures and an insurance firm's survey on driving habits to calculate that 6.7m people use mobiles while behind the wheel. If the police or the driver choose to take a case to court rather than use a fixed-penalty notice, the maximum fine is £1,000, or £2,500 for drivers of vans, lorries, buses and coaches.